I’m not really big on skin care products and the only time I do use facial cleansers and moisturizers is when my wife buys a product but ends up disliking it. Instead of tossing it in the garbage, I end up using it as long as it doesn’t turn me into a woman. There is nothing wrong with a guy wanting clear, smooth, and oil-free skin. And I’m sure women dig that in a man as well. 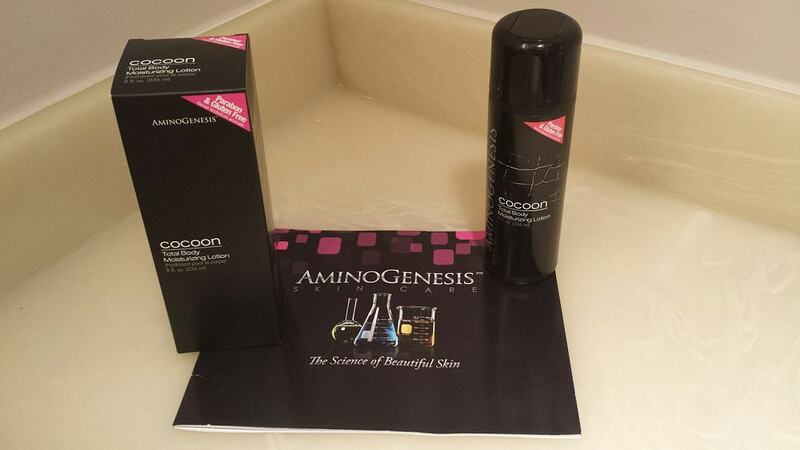 We received a fantastic product in the mail from AminoGenesis Skin Care. The product is called Cocoon Total Body Moisturizing Lotion and something that my wife and I both use on a daily basis. It is a Paraben and Gluten Free lotion that not only moisturizes but has so many other uses as well. This versatile lotion can be used for dry or flaky skin, burns including sunburns, stretch marks and scars. The benefits include soft, smooth skin that looks younger, brighter and more radiant and feels hydrated. So what sets Cocoon body lotion apart from other lotions? In addition to the above mentioned facts, this product is formulated with 17 different amino acids which provide the building blocks for collagen and elastic which are essential to healthy skin. AminoGenesis recently improved this already effective body with a patented new peptide called Preventhelia that helps protect the skin from everyday stress that age the appearance of the skin. I recently got a nasty case of Pitryriasis Rosea which left my abdomen area with red dots and rashes. It didn’t look pretty and apparently one of the treatments for it is to go tanning. Living in Vancouver, BC means we don’t really get much sunlight. So, I went to a tanning salon and I found out that a 16 minute session is a bit too much exposure for me. Everything was normal until the next day when I saw myself in the mirror looking like a tomato. Honestly, this Cocoon Lotion really did help cool my skin down and prevent the flaky and dry skin associated with sunburns. Pityriasis Rosea also causes a lot of ithching and this seemed to help with a cooling effect. This is not a cure for this condition but I’m mentioning it as it was very useful for me in terms of helping with the terrible itching. It also has a very pleasant citrus smell and my wife loves how easy it rubs on the skin. According to her, the lotion just sinks into the skin. I didn’t notice any “sinking” but she uses lotions more than I do so maybe she knows what she’s talking about. You will also notice that it doesn’t feel oily or greasy like many lotions and disappears almost like a serum after a minute or 2 of it being on the skin. I would highly recommend this lotion as a gift for your lady (and for yourself!) and be assured that she will NOT be disappointed. Another interesting thing is that this lotion is used by American Marines of Task Force 812 based in Afghanistan. This product is a perfect for conditions where the sun is intense and the weather is dry. The company is also working on a new line called Working Man. The retail price for the Cocoon Total Body Moisturizing Lotion is $44 but you can get a 20% Off by using the Coupon Code: Man15.